IAM Retiree John Harrity will be serving on the Energy Committee for Connecticut Governor-elect Ned Lamont’s Transition Team. Lamont was endorsed by the Connecticut State Council of Machinists (CSCM), who also turned out in force to support the campaign by knocking on doors and calling union members across the state. Harrity retired last March and is a 38-year member of IAM District 26. 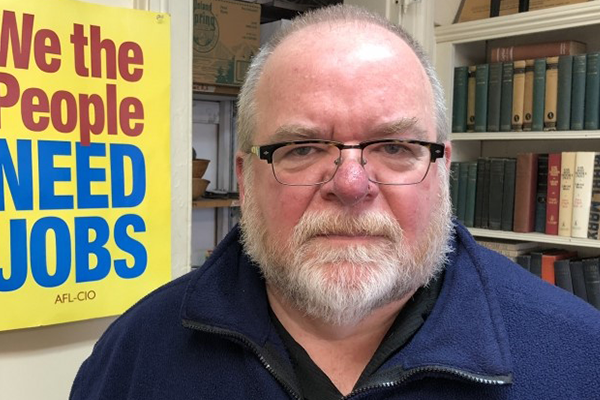 He is a founding member and current Chair of the Board of Directors for the Connecticut Roundtable on Climate & Jobs, a coalition of labor, environmental and religious groups working to shape public policy in the face of looming climate threats. Harrity has long concentrated on climate change as his area of focus for continuing activism, and authored the resolution passed at the 2016 IAM Convention designating climate change as a priority for the Machinists. Harrity continues to serve on the Board of the Connecticut Green Bank, a quasi-public agency that helps finance renewable energy projects in the state, and has been invited to join the Board of the Labor Network for Sustainability, a national organization focused on jobs and a sustainable environment.